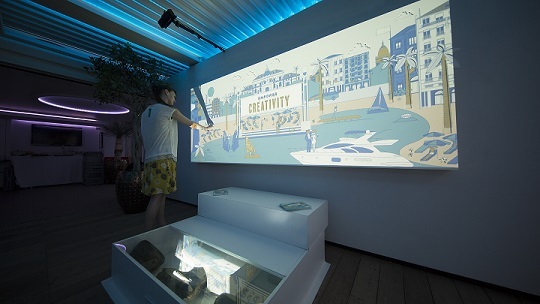 Cypress, CA, USA (October 29, 2015) – Christie® and Microsoft brought mixed-reality technologies to the beachfront in Cannes, France for the Microsoft Beach Club during the 2015 Cannes Lions International Festival of Creativity. Visitors to the Microsoft Beach Club experienced the latest in projection mapping collaborations via two customized projects using Microsoft Kinect technology and Christie projectors and software. Housed in a white-tented pavilion on the beach, Christie and Microsoft displayed two projects designed to show how Kinect and Christie projectors can be combined to inspire a creative space. Using Microsoft Kinect and a Christie Mirage HD14K-M projector, the first project, dubbed “Light Marketing,” warped images onto visitors in real time as they entered and moved around the pavilion. 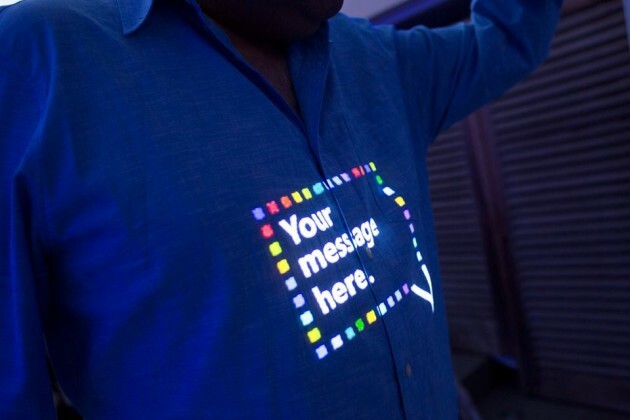 “‘Light Marketing’ can be used to show real-time content on people for shopping, concerts or installations and the point was to make it seem like a magical experience,” added Chad Faragher, senior product developer, Software, Christie. The second project – “Light Mural” – was a 10-foot by 4-foot animated scene of beach life featuring Kinect and one Christie DWU951-Q projector with an ultra-short throw lens. When touched, the interactive mural sensed depth changes and came to life with pop-up images. Christie engineers spent three months working with Microsoft on the “Light Marketing” and “Light Mural” projects and overcame numerous environmental challenges including hot weather, high ambient light, salty air, no roof and a wooden floor that vibrated when walked on. “Christie needed to provide high brightness projectors that could compete against the high ambient light here. We also had a lot of heat to deal with, and these projectors were asked to be enclosed away in boxes so we needed to provide projectors that could compete in this environment and still continue to operate,” said Faragher. Overall, the projects were a success for both Microsoft and Christie. “It was great working with Christie because they try to explore what projection can do. They’re very creative people and there is a big tradition in cinema of how technology is used to tell stories better. The project was a fascinating marriage between technology and creativity; engineers worked to overcome all these challenges and the artists providing content were able to use technology in a way that could inspire storytellers in museums, theme parks and retail spaces,” Barraza concluded.